“Disability is not Inability” is what greets everyone on the front gate. I visited the Thika Primary Board school in Nairobi for blind and visually impaired students ages 13 and below. Ages are never very fixed markers in Africa, because when a child starts school really depends on when someone decides to bring them to school. They call the earliest class beginners class rather than nursery as some students start the school as adolescents. We met one girl who had just arrived, but was in the beginners class to learn Braille. She had been abused and was very cautious, but we were all so relieved that she was here in a much safer place. There’s no doubt that it will take some time for her to build trust in her surroundings. 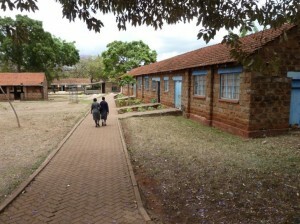 Thika is considered the “Mother of all visually impaired schools” in Kenya. It was started by the Salvation Army, who still own the property, in 1946, and with sturdy walls it was clearly built to last. The sidewalks were also very well maintained as well as the gardens around the buildings. 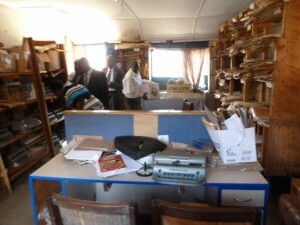 They also own the high school next door where most of the children will go when they graduate from the primary school. We visited here because this is a school that we assist with providing new braillers, we do brailler repair, and we hold technician training workshops. We have chosen this school to make it as close to a perfect model of what we’re aiming to accomplish: that all blind children have access to a Braille machine all day, every day. This is also part of our strategy to attack one school at a time, and to make sure we fulfill all of their Brailler needs. But there’s still a long way to go, with about 800 students in Kenya alone who do not have access to a machine when they need it. Because Thika’s Braille machines are all working, all the students that need a machine now have access to one during exams, which has helped them perform far better. 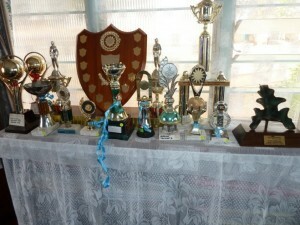 The school is now winning academic awards and is starting to be competitive with schools filled with sighted students. The headmistress was very proud. The students who come to Thika come from all over Kenya, many from the rural areas where blindness is a bigger problem, because of untreated cataracts and the flies that cause dracoma. We’re so grateful for the other organizations that are tackling that problem, but the students here are grateful that we’re helping with their needs. Sadly their eyes can not be fixed. a witness when part of the school’s choir sang to me in perfect and enthusiastic 4-part harmony. They perform often around town, which is great for their presence in their community, especially when you consider that singing runs deep in their community. Beyond academics, the students learn to live as independently as possible; they clean their dormitory facilities, make their beds, wash their clothes and hang them to dry. They learn to garden, to take care of cows and chickens, and obviously how to use a cane. 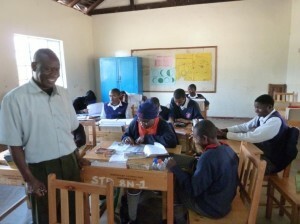 When they are finished with schooling they are prepared to contribute to their family life in very positive ways. If they were not at school, there’s a good chance that they would be left to sit in a corner where they would be safest. It is beautiful to see their potential blossoming in this environment. One little postscript about our visit to Kenya, is that a large company that provides fragrances to both P&G and Unilever is going to start a pilot project in Nairobi with blind university students to do smell testing for soaps. While it’s just a pilot, it has the potential to lead to a much larger permanent project employing blind students on a more regular basis. 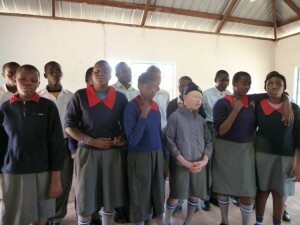 The pilot will be successful if the company thinks that blind students can represent African tastes in general. My fingers are crossed, and the KBT is excited to help run this effort. We’ll keep you posted!